Rock and Roll (Clare-Whiting) – Mcafee reports that the song appeared in the Reliance feature film Transatlantic Merry-Go-Round (1934). The sisters sang it “with Jean Sargent and chorus, probably Jimmy Grier Orchestra.” A Youtube provider who spins the record confirms that the music was played by Grier’s orchestra. I was unable to find that film segment. This audio track may be the same one used in the film minus the Jean Sargent and chorus parts. The rocking and rolling of the lyrics refers consistently to the motion of the sea. Many of the 1934 recordings and most of those during 1935 and 1936 listed at the Boswell Sisters Discography of Guy McAfee are Connee Boswell solo recordings. I may do a feature page on her solo career eventually. 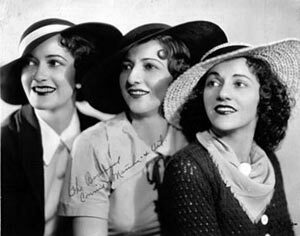 Despite a new contract, with Decca, in 1936 the sisters ceased recording together that year, the last session being on 12 February 1936.